Today was supposed to be a transitional one, wherein one goes from nowhere to nowhere. It didn't quite work out that way. About three blocks from the motel I pass a police car waiting to turn out of a side road. Nothing exciting there as I am doing 30 mph on cruise control and have not killed anyone utterly to DETH recently. He follows me for a bit and then turns off. Thirty seconds later he reappears with his lights a-flashing. I am righteously, if not nicked, then at least pulled over and given the third degree. Two of his mates rock up just to make sure that I'll be shot if I try to escape. 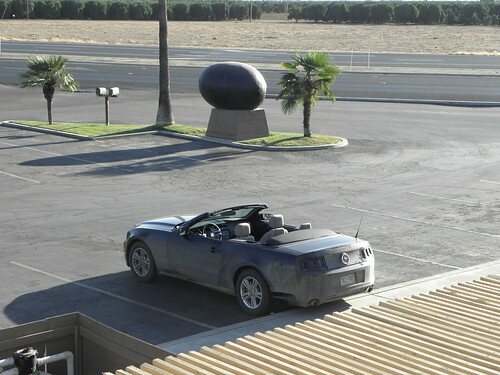 After producing paperwork a-plenty, I finally learn than someone has half-inched a rented black Mustang convertible from a motel in town, though not the one at which I stayed. Fortunately I still had the receipt, as I tend to bin them before setting off. I aten't on expenses, more's the pity. Suitably chastened by Mr Obambi's Finest, it's skirt-Los-Angeles time. LA having expanded to the extent that Hemet actually makes it onto the Los Angeles detail map in my road atlas. Even though Beverly Hills is a hundred miles away. By turns north and west via San Bernardino (cue Eagles Of Death Metal singalong), Palmdale, Lancaster, Tehachapi and Bakersfield. Most of it is deserty, in a mountainy kind of way. Or vice-versa. And mostly unexciting. When it wasn't deserty or mountainy it was suburban. With a million traffic lights. And a roundabout in Palmdale which almost caused some imbecile in a Honda-badged version of Postman Pat's van to remove the nose of the Mudstang. Imagine, if you will, a motor-car that has climbed the highest peak, descended to the depths of Heck1 and been subjected to that torture you see in movies about the French (WOCAB) Foreign Legion only to be demolished by a Thing designed in crayon by a small child. The ignominy. 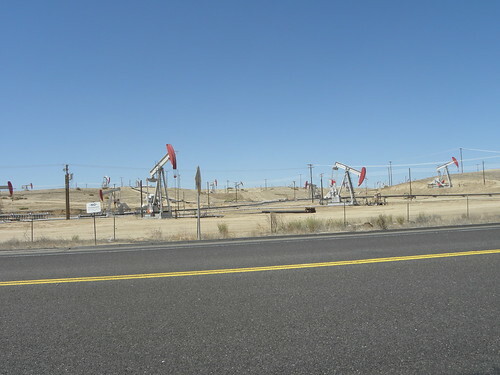 The Bakersfield region is famous for oil. There, I've said it. After Bakersfield some Things happened. Once again the interminable straight roads and heat were sending me to sleep, plus it appeared that I would reach Lindsay before the motel opened for check-in. Consult the map. Find somewhere yclept "Wofford Heights" which sounds pleasingly like somewhere which could be in Sussex, tell Emily to take me there. Relentless driving like a menk, however, took its toll on the supply of motor-spirit aboard and I was obliged to refill the tank at Wofford Heights. The proximity of Bakersfield does little to help "gas" prices here, though, as the bloody robbers wanted over four dollars a gallon for the stuff. I'd seen it in Arizona for <$3.30. As it was now check-in time at Lindsay, Emily was instructed to direct me there. O woe!. 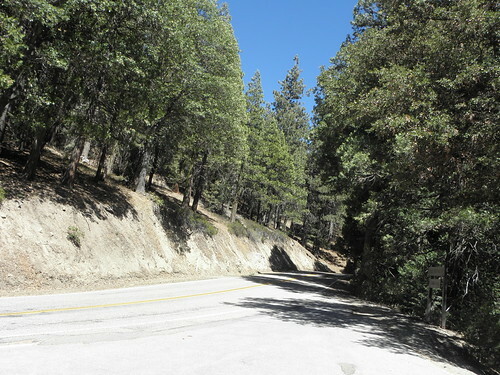 Much of the route is back over CA-155! How tragic. Fuel consumption from Wofford Heights to here, about sixty miles, was about fifteen miles per titchy US gallon, due to putting the queerbox in "Sports Shift Mode". The manual change is still a switch on the side of the stick, though, which means steering with one hand and reaching around the water bottle in the centre cupholder with the other. The next generation Mustang will have proper rear suspension and be available in right-hand drive for the first time - I hope they finally bung some gear controls on the steering wheel as well. That, apparently, is The World's Largest Olive and is situated close enow to the motel that I could see it from here were it not dark, and were the curtains open. I do not think it is made from actual Olive-Stuffs, though. On waking: All rooms in which I have stayed since 2003 have alarm clocks of varying degrees of sophistication. The one feature that most of them have in common is that they do not work. Last night's, for example, reset the time to midnight every time I tried to set the alarm-going-off time. The one in Yuma was ten minutes fast and had no obvious way of correcting this anomaly. The one in Moab utterly failed to go "beep" at all. I am wondering whether it is wise to bring my own in future; I suspect not given the other uses to which alarm clocks may be put. Are you really parked across 2 parking spaces ;-) (or is it "the angle of the camera" !). Alarm clocks: its the 21st C: surely you should use your phone ? !